What if there were no emojis? That would be a world difficult to imagine. Earlier, our conversations had words and words only, but today it is not just words, emojis have also become an inseparable part of our conversations. A few years ago, there were only a handful of emojis with basic expressions like Happy, Sad, Laughter, Crying, Anger, etc. But today we have emojis for every single thing. Not just expressions, we have emojis for objects as well. Emojis are everywhere. It has become so popular that they are even making a movie on it. Because of its high popularity, Google Play Store is flooded with a good number of emoji apps. And with some of them you can even create your own custom emojis you can then use them in conversations with all of your friends. 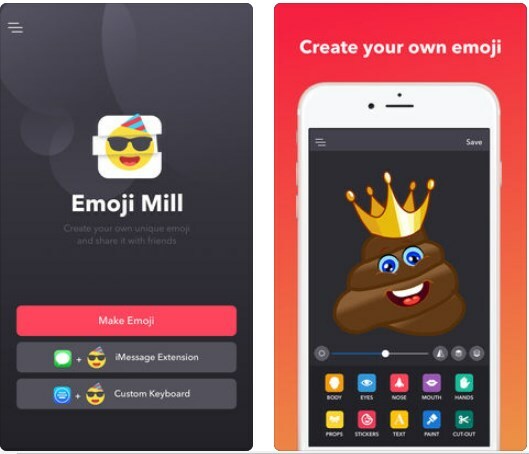 Emoji Mill is simple, efficient and funny emoji maker for iOS devices. This app gives us the freedom of creating our own personal, unique and awesome emoji we can send to and share with our friends. With this app the possibilities of new unique emojis are endless. With thousands of stickers, emoji building parts and bit of imagination we are able to create custom unique emojis to help us express ourselves better in chat conversations. The emoji we created with the Emoji Mill app can also be shared using our phone’s Custom Keyboard and iMessage Extension very easily. The Emoji Mill’s app provides us with a powerful and easy to use emoji creator. This app contains hundreds emoji bodies and parts like noses, eyes, mouths, hands and other props we can combine, mix and match for the creation of the perfect emoji we imagined! Adding text, stickers, cutouts and different colors is also available and very easy. This emoji maker app is simple and easy to learn and use, so anyone of us can create some funny and unique emojis. The app also supports the Custom Keyboard and the iMessage extensions of the iPhone. Saving the unique and custom emojis in the Gallery is simple and fast task. All of the newly created custom and unique emojis can be shared with your friends and family on any social app, be it Facebook, Instagram, Snapchat, Twitter, WhatsApp or others. If you are interested in letting your imagination and creativity run wild, you can download Emoji Mill for free at the App Store today!